I’m not going to pretend I invented this. 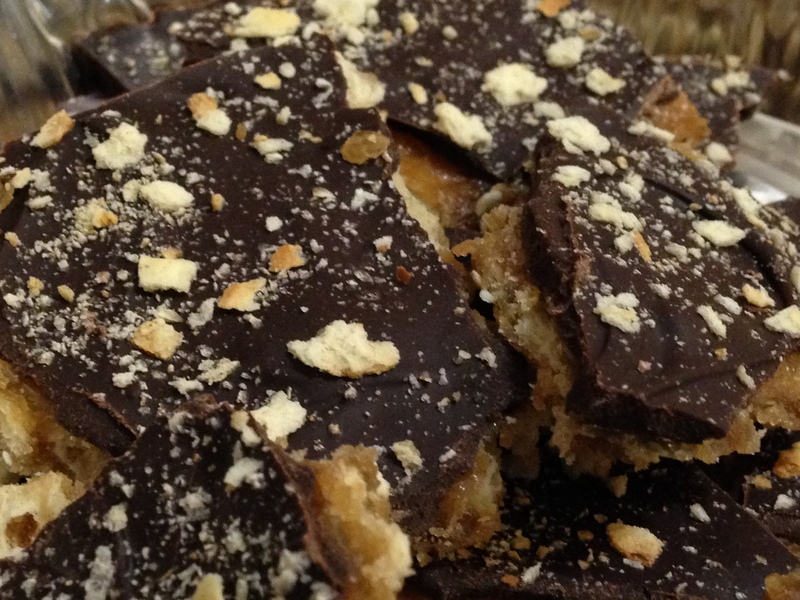 A quick Google search for saltine toffee bark or some variation of that will turn up this super simple recipe. I think the only adjustment I made was the amount of butter I used (spoiler: it was more than most recipes you’ll find out there). Why the change? First it was by accident; doubling the initial amount. I learned from people that they actually liked it a little chewy. I, unfortunately, didn’t but I found a nice little compromise that allowed it to be toffee-like but not break your teeth. Preheat oven to 350°F. Line a cookie sheet with tin foil and spray the surface with a non-stick cooking spray. Lay one layer of crackers salted side up on the cookie sheet. Place butter and brown sugar in a small sauce and heat until the mixture is completely combined and begins to boil, stirring constantly. When mixture is well combined, pour evenly over crackers. Spread it where necessary. Bake for 5 minutes. Remove from oven and sprinkle chocolate chips over the hot toffee. Let sit until the chocolate chips have melted and you can smooth it completely over the toffee layer. Crush the remaining saltine crackers and sprinkle over the chocolate layer. Refrigerate until it’s set and then break a part and serve.